I’m lazy. As my good friend Tricia told me this morning, I’m a super mom in some areas and lazy in others. As I chatted with her in my pj’s amidst a super mess house, I peeled 4 lbs of garlic and bragged about how my 20 mo is fully potty trained, day and night. Yeah, I’m awesome. Sometimes I work hard so I can be lazy. Like garlic paste. I love fresh garlic and before I devoted my life to eating only real food, I bought garlic paste in the jar. While it’s not horrible, it’s still not as good as the fresh stuff but sometimes I just too lazy to peel the clove, chop it up and then clean up the mess. Sometimes I just want to open a jar and that’s it. I can be that kind of lazy. So when I’m feeling not lazy, I’ll make garlic paste. This is what 4 lbs of garlic looks like. 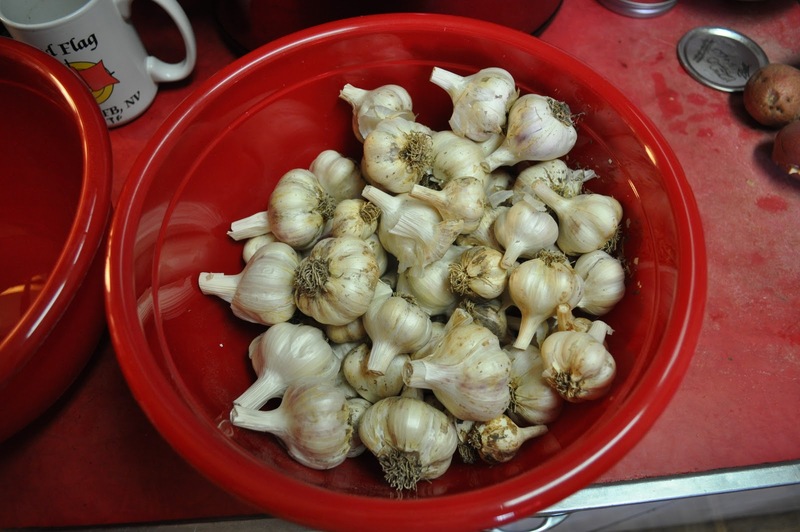 Today I was feeling extra spunky and made 2 1/2 quarts of garlic (1 of garlic paste and 1 1/2 of pickled whole cloves). How did I peel 4 lbs of garlic without going insane? A while back a video was going around Facebook of a chef showing how he throws a whole head, just separating the cloves, in a large metal bowl, topping the bowl with another and shaking the crap out of it. It works! Love it! I used 2 plastic bowls which worked but I think metal would be better. Since plastic bends, it was hard keeping the skins from flying all over my kitchen. Of course you don’t have to make a whole quart of it. I’ve made a pint and even just a cup before. Just divide the recipe accordingly. I’m lucky enough to be friends with a gardener who specializes in garlic. When she posted on Facebook that she still had a bunch from the end of the season, I jumped on it. I kept the soft neck for fresh recipes and all the hard neck was lacto-fermented since it doesn’t keep as long. 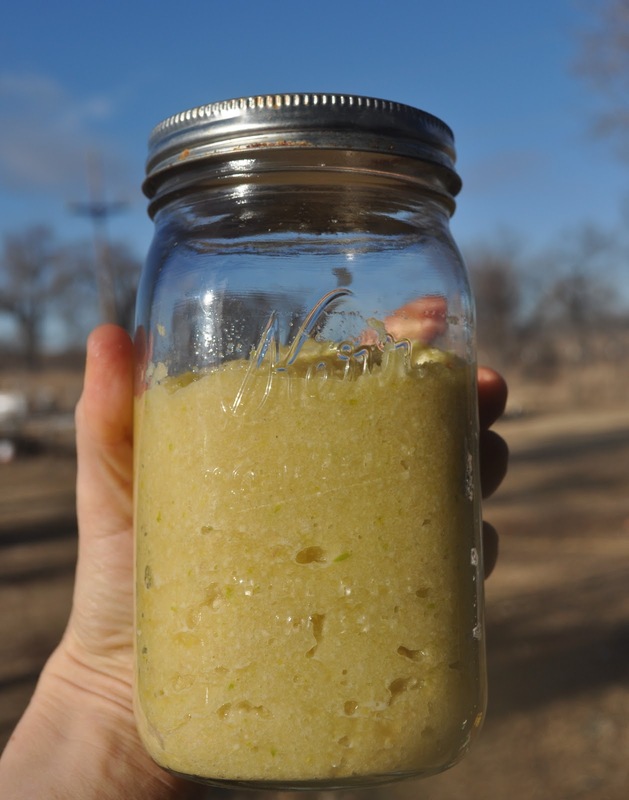 You can use lacto-fermented garlic as you would regular garlic. I prefer to not heat it up too much because you kill off all those wonderful probiotic buggies. Add a small scoop to a cup of broth that has cooled enough to consume for a super yummy and healthy treat. Garlic is also wonderful this time of year to fight colds and the flu. Mix a bit of garlic with honey, cayenne to kick strep. It works! Place everything in a food processor and pulse until a smooth paste forms. Scoop into a pint sized mason jar and using a spatula, clean the sides of the jar and press out any air pockets. I’ll gently tap the jar on a padded surface to smooth it out and remove bubbles. Let set at room temperature for 5-7 days and then move to cold storage. I’ve heard garlic is best when aged a few months. I wouldn’t know because we eat it too fast. Maybe this time I’ll find out since I made so much. I’ve actually stopped using whey all together. As long as you have a good anaerobic container, no whey is necessary. Just leave it out. If you don’t feel comfortable doing that, you can use a starter culture like Caldwell’s from Cultures for Health http://www.picklemeto.com/culturesforhealth. Just 1/8 tsp of the culture is enough. It probably would work. Haven’t tried it myself. It would give the garlic a gingery taste but for some dishes that would be a good thing. No worries Marie! Garlic often times turns green/blue during fermentation. It’s just a natural chemical reaction, nothing bad at all. It might turn back to an off-white/ brownish color after a few weeks or so. Yeah the top is turning a little brown already. Thanks! I threw out a whole jar before reading your post, it turned a lovely bluish green that was fine but then the root ends started turning a little blackish brown. It was after it was in the fridge is this normal and ok, opps if so. It smelt soooo good I hated trowing it away. So…2tsp of salt is all that is needed for the whole pint? Just want to make sure no more salt is needed if I don’t plan on using a whey starter. Thanks!!! How does the recipe change if using a pickl-it? Can I just open a bottle of minced garlic and follow this? No, it wouldn’t work. Sorry! Bottle garlic like that has been heat processed so there is no living bacteria in it to start the ferment. You need fresh garlic. Bummer. Thanks for the reply Melanie. Is it important to use organic garlic, or will any store bought garlic do? I have just started to ferment foods and I am always wondering this. Thanks!